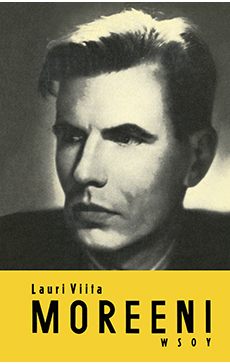 Lauri Viita’s first novel Moraine was published in 1950. Along with his first work, a collection of poems released in 1947 entitled Concrete Mixer, the novel is Viita’s most renowned work. Moraine is a very personal account of the life of a working-class family in the industrial city of Tampere in the first decade of the 20th century. It is also a strong depiction of Pispala, a working-class neighbourhood in Tampere where factory workers built wooden houses by hand, one by one, on a ridge of moraine. The work is, at the same time, a historical and social description of the journey of the Finnish working class from the civil war of 1918 all the way up to the recession of the 1930s. The father of the Nieminen family is a carpenter, while the mother is an optimistic character full of love and humour. Of the seven children, the ones with the strongest voice in the story are the eldest, Paavali, and the youngest, Erkki, a pensive youth who wonders at the mysteries of life and is said to be Lauri Viita’s alter ego. Through the mother’s character, the author brings forth his own central thoughts about the importance of ordinary, everyday life. Alongside this optimism about everyday life, however, the novel also deals with darker themes: death and suffering, economic speculation and cold-blooded exploitation of others. Moraine is an exceptional portrayal of working-class life and the civil war because it looks at the working-class society of Pispala authentically from an insider’s point of view, appreciating and bringing forth the wisdom and fullness of common people, unlike in traditional depictions by outsiders, which are often denigrating. Behind political idealism, Viita also sees the ordinary people, average workers and other decent citizens who really were not interested in societal change. Viita’s Moraine, with its strong narratives and virtuosic language use, contributed to the start of the boom in working-class epics after the second world war and received much attention from critics at the time. Its significance as a portrayal of a time period and social class has endured for decades, and Moraine has become a classic that every Finn reads in school. A total of over 100 000 copies of Moraine have been sold in Finland. Moraine has also been published in German, Hungarian, Polish, and Swedish in the 60s and 70s.